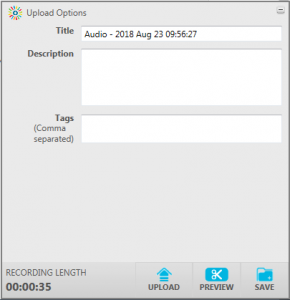 Now that you have seen the process for the various other options the process for recording a presentation combined with a lecture, webcam and voice is fairly easy to do aside from the initial setup. 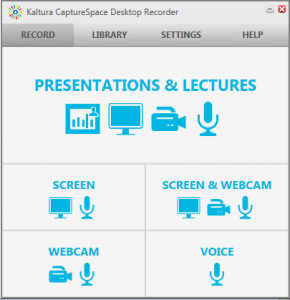 To start recording click on ‘Presentations & Lectures’ in the CaptureSpace window. 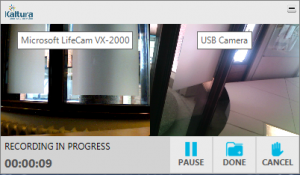 Your default camera will already be selected in the first box (in this case the Microsoft LifeCam VX-2000). Choose the video quality for the camera. To add multiple camera’s please connect them prior to selecting the record option! Once connected press on –None– to see a drop-down menu of available camera’s and select one. Repeat this if you wish to add a third camera! As with the prior chapters select the screen you wish to record the presentation from (under screen capture) as well as select the highest possible quality (1080P preferred). Under Presentation you can select the presentation you wish to add to the video, the most recently opened presentation file can already be loaded, if not or if you wish to record another presentation please click Browse and browse towards the presentation you wish to record. 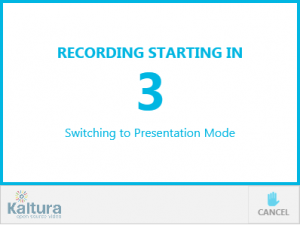 Leave the ‘On/Off’ selectors at on to record the presentation. At sound choose to either use the default input device or click on ‘Default’ to select another source. Leave the sound selector at ‘On’ if you wish to add sound to the video. After the countdown finishes your recording will begin. If for whatever reason you wish to pause or cancel, press the appropriate button. 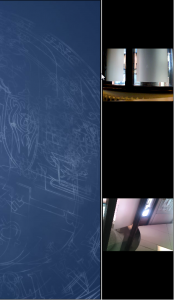 The video feeds will also be shown above the controls. When you are finished recording, press done. The video will start to save. You can now also see the video feeds to the right hand side of the presentation.